What is a Current Reality Tree? 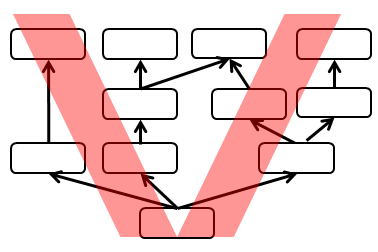 UDEs are written in round squared boxes and arrows depict the relationship. The linkage between UDEs makes a shape of a tree, the root cause being, as the name tells, the bottom-most cause. ToC assumed (still does?) that most Undesirable Effects are the visible effects of a unique or a small number of critical root causes*, the constraints. If the constraint can be identified and eliminated, all related UDEs will disappear. Therefore it is meaningful to focus all energy and limited resources to identify and elevate the constraint. A constraint is a limiting factor that hinders the system to deliver more value. ← Goal Tree: how to assess Necessary Conditions status?